Need more adventure and excitement in your life? Ready to take the plunge? Central Oregon is place to be this summer. Central Oregon Bungee Adventures offers the highest bungee jumping experience in North America, right here in Culver, Oregon. Located at the Peter Skene Ogden Wayside, along Hwy 97, on the high bridge. Jumpers can free fall for approximately seven seconds into the Crooked River Canyon below. James Scott, owner, has been bungee jumping, skydiving and BASE jumping for more than 20 years, and his staff are professionally trained to give you a good time and will get you back safe. They provide all the equipment and training for this one-of-a-kind thrill. 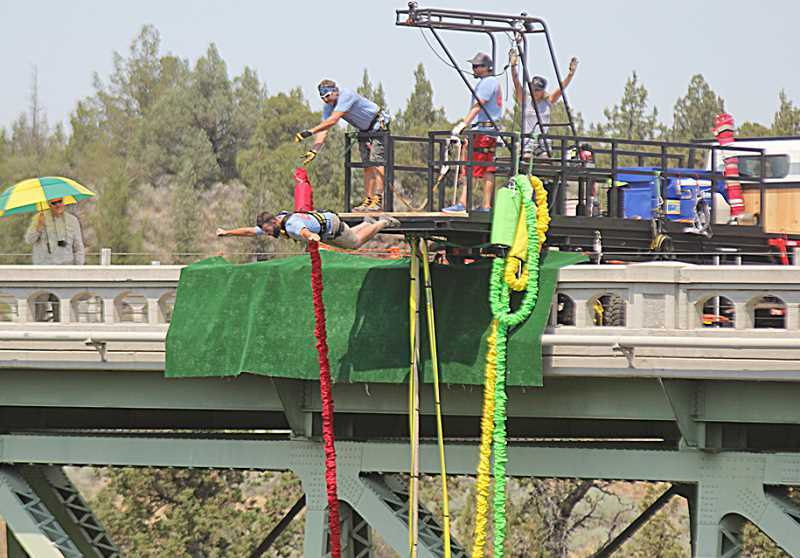 Scott received permission from the Oregon Parks and Recreation Department in 2015 to offer bungee jumping in the Crooked River gorge. It’s the first time the state has approved a commercial bungee-jumping operation at any state park. Cost: $129 for the first jump, $49 for the second. Reservations are strongly encouraged. Video of your jump is available for $29. Jumpers must be at least 14 years old and weigh between 80 – 300 lbs. ; all jumpers under 18 must have a parent or guardian present to sign the waiver. Making a Memory Last – jumpers can buy photos and video of their adventure. WARNING: Visitors to the Ogden Wayside – please obey the signs and leash your dogs inside the vehicle and then take them out. Do not leave them inside your vehicle when temperatures are hot! Many dogs have died from jumping over the edge all while pet owners are still looking for the leash.